I can’t decide if this post’s title means I’m going to tell you about my favorite things (stop looking under your chair, there will be no giveaways. Despite my childhood beliefs, I’m not actually Oprah) or show you a bag of chips I ate, tell you about my regrets and then get Gayle to feed me salads on a yacht while I nap and Stedman moves my legs. Maybe there’s something more doable in between. ‘Cause I don’t know Gayle or Stedman and I totally don’t have a yacht. Or know where to find one. Ok, let’s forget ‘favorite things’ and the fact that my dinner last night consisted of taste testing chips (shut up, it was for science). Real life things! I got sick again this week. I blame children. They’re always covered in jam and cooties. Mostly cooties. These are my favorite hot drinks for my least favorite times. Xiao’s blend from Peet’s (pricey but pretty damn perfect) and homemade ginger tea. Fresh ginger tea is spicy and amazing and cheap. Peel a hunk of ginger and slice, chop or grate it into a pot, cover with multiple cups of water (about 1 cup water for every inch of ginger- this is a strong ratio and will seriously clear your sinuses), slowly bring to a boil, stock-like, for the most possible flavor, strain into cups with honey and lemon juice and breath in the steam. If you’re really sick throw in a crushed clove of garlic and a 1/2 tsp of cayenne pepper for every 2 cups of water- I start on the weaker end of the ratio with these additions. 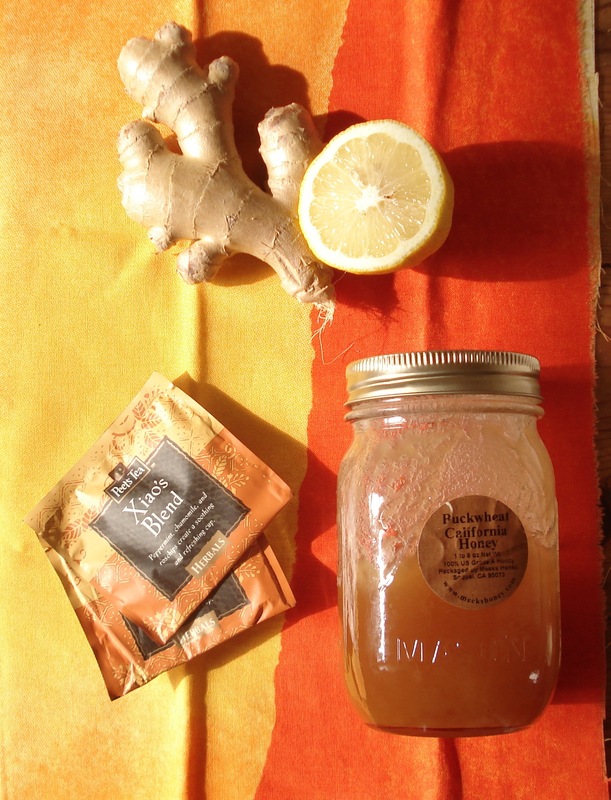 When I’m extra lazy I just throw a few slices of ginger in a mug with honey, top it off with hot water and lemon juice. Works in a pinch. The real benefit of making a whole pot of the stuff is that you can just throw more water in once it’s gone and you’ll have a new, slightly weaker batch of tea in twenty minutes and your sick self won’t have to chop or peel again for days. I’ve also been known to just drink hot water with lemon and honey. ‘Cause of how uncoordinated I get when sick and half asleep. Safety first! I’m gonna backtrack a bit now. 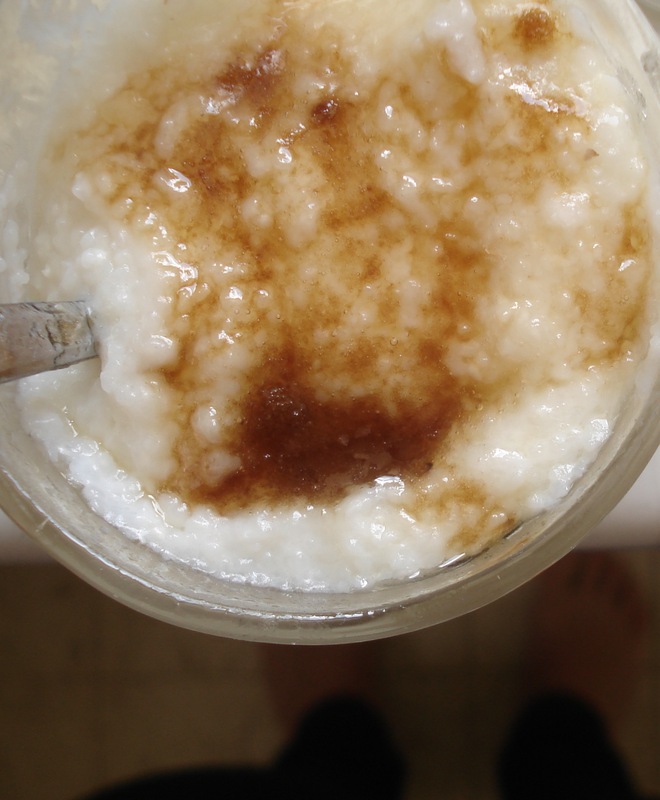 Because hot buttered grits with brown sugar is stupid good. Are you guys eating grits yet? If you haven’t started yet… maybe you shouldn’t. It’s much harder not to eat grits constantly once you know how good they are. But surely you’re making sundaes. You’d be bananas** not to. And if you want to skip the scary sugar boiling thing I did last week, you can do what I did this week and make a small batch of Deb’s butterscotch sauce in the microwave. Yeah. I’m gonna tell you about this and trust you not to die immediately. You have self control, right? Combine all ingredients except for the vanilla in your bowl, microwave for 3-4 minutes (until it has bubbled a bit and everything’s all copacetical), stopping and stirring every minute, add vanilla, stir, cool slightly and use a ladle to pour it into your face. Or just dump other sundae stuff into that same bowl. Or be nice and share as there should be enough for two. Or do like me and make a mini apple crisp and eat the entire thing in one night with ice cream and this microwavable miracle while sick like a hungry hungry fool. This is about 1/3 of said crisp. It had a crunchy oat and pecan laced topping and sweet and sour cinnamon covered fuji and granny smith apples underneath. It was glorious. Hey. 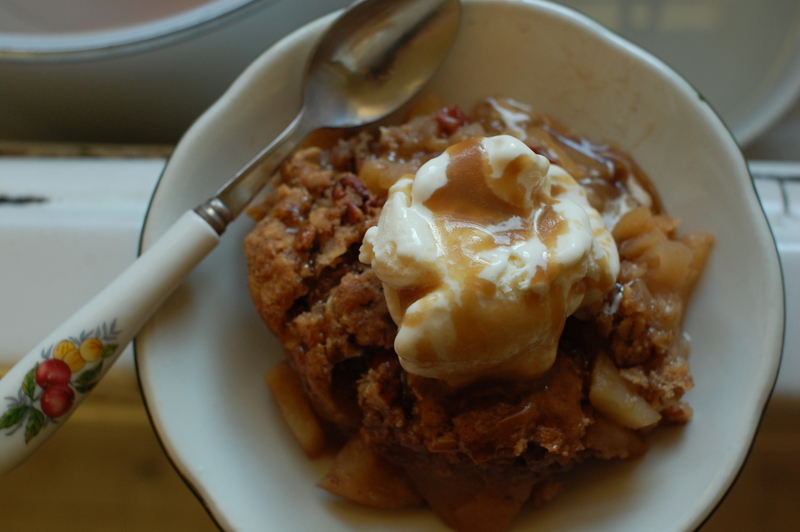 I made apple crisp the last time I was sick too. Weird. I developed a new habit! You know what else happened the last time I got sick? A wonderful lady brought me bread. The bread she gave me this time had fruits and nuts in it. We covered that bread in this glorious stuff. 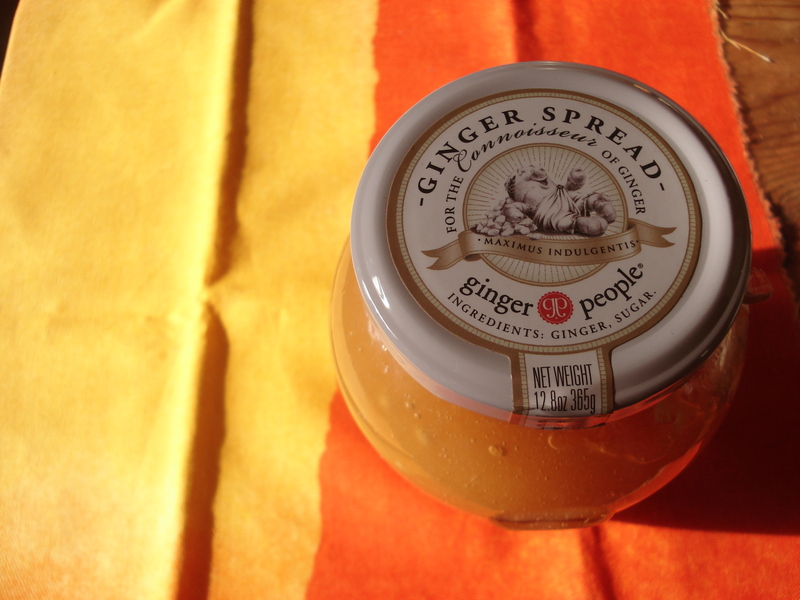 It’s like smushed up marmalade made of ginger and I love it and I’m gonna put it in french toast with something creamy and die of joy. That’s what’s gonna happen. With mimosas. ‘Cause we’re princesses. So I guess I sort of do have a Gayle. Now all we need is a yacht. *Does it freak you out how well I know your mind? The answer is yes. **Yup. Still doing that. Just try and stop me. Because I can’t. Seriously. Help. ***Bourbon is totally my spirit animal. I’m having one of those weeks where it seems like I’m spinning in a hamster wheel, trying really hard to go fast and getting absolutely nowhere. But at least it’s a shiny pastel color. And there’s Reese’s easter eggs on sale to go with that bag of doritos I called lunch on Tuesday. All I want today is an avocado. I don’t have the time to make that happen. So I’m eating a lentil and spinach salad with feta and the last ripe tomato in the house. And a night full of Childish Gambino. Because I’m going to see his face tonight. And it’s going to be magical. Even if you can’t see Donald Glover, you can make beautiful awesome sugar coma sundaes happen. I bought ice cream. Like a planner. Who, for now, is done making ice cream. I made a 1/3 batch of this salted butter caramel sauce. Make a full batch. You won’t regret it. Also, burn it just a little. Takes some of the aggressive sweetness away and makes things way more interesting. Secret: I cheat on the hot fudge front. I just make a tiny amount of ganache in the microwave (gasp) (I know. Sorry, World/Self). Homemade whipped cream. You could skip it, but why? 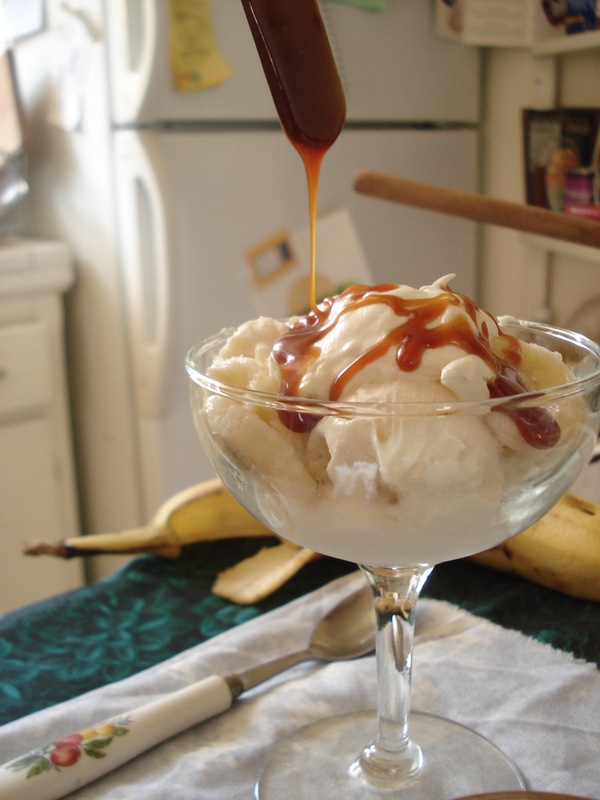 It’s not a sundae without a banana. I stand by this. The sketchy cherries are optional, bananas aren’t. 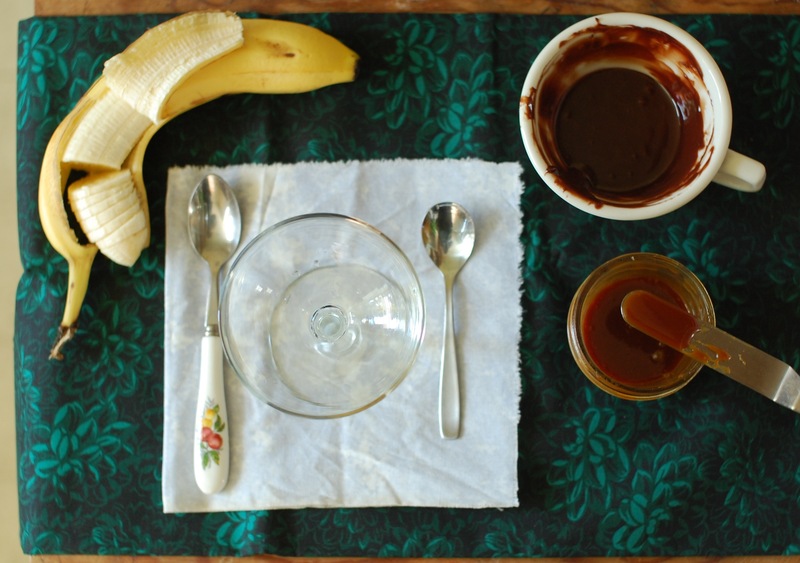 But seriously go bananas (I’m sorry, I’ll stop) with the toppings. And last but not least don’t bother trying to share. It’s a lost cause. Now I have to go stand in line to see a beautiful man… along with a bunch of rando hipsters. Wish me luck! Or curse me with jealousy. Whatevs. Eat a sundae! Tagged as caramel, Childish Gambino, Donald Glover, ganache, why can't I choose between aggressively healthy food and doritos?